An article appeared today in Indian Express. An aim to divide the Muslim community of India. Some stray Shia sycophant personalities for material gains have been bootlicking of BJP communal leaders & politicians just for some posts in the government. They have no mass base in the Shia community. Following is the excerpt of the article. One can visit the website to read full. Ever since his election as Uttar Pradesh Chief Minister, Yogi Adityanath has been cultivating the Shias, a minority within the Muslim minority, which relates uncomfortably to the Sunnis, as is evident from recurring tensions between the two groups. He first appointed a Shia, Mohsin Raza Naqvi, an ex-Congressman who had joined the BJP in 2014, in his government as his only Muslim minister, to hold the minority affairs portfolio. Most recently, he nominated two Shias for election to the Upper House in the state assembly and both of them became BJP MLCs on April 26. 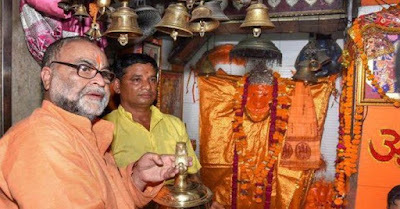 Besides Naqvi, Bukkal Nawab, formerly in the SP, had resigned from the legislative council to allow one of Yogi Adityanath’s deputy chief ministers, Keshav Prasad Maurya, who needed a seat to stay in government, to be elected. But before that, both Raza and Nawab visited temples and prayed before Hindu deities.